Leanna welcomes opportunities to present programs at industry conferences and client specific meetings; these are usually brief overview or “sampler” sessions designed to introduce participants to new skills and techniques. June 18, 2014 – 1-day pre-conference workshop “At Ease with Visual Facilitation”- click HERE to register! 4 spaces left! Check out a sneak preview of the workshop HERE. 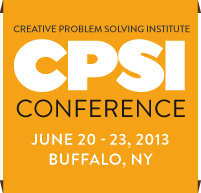 June 20, 2013 – 1-day pre-conference workshop “At Ease with Visual Facilitation” – SOLD OUT! June 21, 2013 – 1-hour “Visual Facilitation for Qualitative Researchers & Moderators” 36 attended! June 23, 2013 – 1.5 hour “A Brief Introduction to Visual Facilitation" 65 attended! "Loved the application- Leanna did not talk about a visual medium, WE created the visuals! Well Done! So practical and interactive!"